Wiesbaden, Germany, 2015-4-30 — /Travel PR News/ — Norwegian Cruise Line’s largest ship, Norwegian Epic, arrived this morning in Barcelona, Spain to begin another season of 7-night Med cruises until November 22, 2015. The award-winning Norwegian Epic features a new entertainment line-up for her cruises from her new homeport, debuting throughout 2015. Two new Broadway shows will take the stage as headliners: Burn the Floor and Priscilla, Queen of the Desert – The Musical, coming in October. The ship will also feature an all-new British pop music entertainment experience, The Cavern Club, bringing the legendary Liverpool venue where the Beatles performed to life at sea. To celebrate the ship’s return to Europe, Norwegian Cruise Line has published a dedicated 20-page Norwegian Epic brochure, available online as well as in print, featuring the ship’s highlights as well as all itineraries. Broadway sensation Burn the Floor, which has received rave reviews on Norwegian Breakaway and Norwegian Getaway, brings the sizzle and passion of ballroom dancing to Norwegian Epic with “Ballroom Blitz”, an all-new and exciting show specifically designed for European guests. Based on the Oscar-winning movie, Priscilla, Queen of the Desert – The Musical is the heart-warming, uplifting comedy adventure of three friends who hop aboard a battered old bus searching for love and friendship and features a hit parade of dance floor favourites, including “It’s Raining Men”, “I Will Survive” and “Girls Just Wanna Have Fun”. The show will open on the ship’s October 18, 2015 voyage along with a whole new entertainment venue created through an exclusive partnership with the owners of Liverpool’s The Cavern Club – The Beatles’ original breakthrough venue – which will rock guests each evening to the sounds of The Beatles and other international musicians. 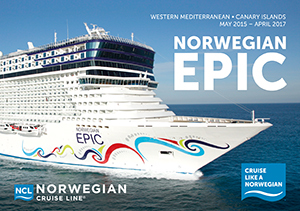 Between May 3 and November 22, 2015, Norwegian Epic will offer 7-night cruises from Barcelona or Civitavecchia (Rome) to the Western Mediterranean, including stops in Naples (Pompeii), Italy; Livorno (Florence/Pisa), Italy; Cannes, France and Palma, Majorca, Spain. During the winter season between November 29, 2015 and April 7, 2016, Norwegian Epic will sail alternate 10-night cruises to Morocco, the Canaries, Madeira and Málaga (Granada), and 10-, or 11-, 12-night cruises to the Western Mediterranean including stops in Sardinia, Sicily and Majorca. In addition Norwegian Epic will sail two cruises to and from Southampton, England in 2015, marking the first time that the ship has visited the port since the inaugural celebration in June 2010. The ship’s 6-night sailing will depart Barcelona on September 20, 2015 and arrive in Southampton on September 26, 2015, with ports of call including Cartagena, Spain; Málaga (Granada), Spain; and Lisbon, Portugal. Following a 22-day dry dock in France, Norwegian Epic will embark on a 7-night Iberian Peninsula cruise from Southampton to Barcelona on October 18, 2015. The ship will visit ports of call including Vigo, Spain; Lisbon, Portugal; Málaga (Granada) and Cartagena, Spain. Guests looking to celebrate Christmas 2015 on board Norwegian Epic can do so on a 9-night Canary Islands & Morocco itinerary which will be offered on December 19, 2015 and those planning to cruise through the New Year can set sail on December 28, 2015, from Barcelona on a 6-night cruise. While cruising throughout Europe, guests can discover why Norwegian Epic was named “Best Ship for Sea Days in 2012” by Cruise Critic, as they experience the ship’s array of recreational activities from the expansive Aqua Park, featuring three waterslides and the largest bowl slide on water, the Epic Plunge, to the abseiling wall, rock climbing wall, bowling alley, and pampering Mandara Spa, one of the largest spas at sea. Foodies cruising through Europe on board Norwegian Epic will delight in the ship’s more than 20 different dining options. Steak lovers can feast on steakhouse favourites, including Certified Angus Beef in Cagney’s, the line’s signature steakhouse. Moderno Churrascaria, Norwegian’s Brazilian-style steakhouse offers guests the opportunity to sample succulent grilled and slow-roasted meats carved tableside by passadors in addition to Moderno’s expansive salad bar. Norwegian Epic’s Chinese Noodle Bar offers counter seating around an open kitchen and serves traditional Chinese noodles, wok-fried dishes and dim sum. For American favourites and comfort food, guests can take a seat in O’Sheehan’s Neighborhood Bar & Grill. Additional dining options include Teppanyaki, a Japanese hibachi-style restaurant; Sushi Bar; Garden Café, the ship’s action station buffet-style restaurant; The Manhattan Room, an art deco inspired supper club; La Cucina, Norwegian’s home style Italian restaurant; Le Bistro, Norwegian’s signature French restaurant; and more. Norwegian Epic also boasts 20 unique bars and lounges, including the SVEDKA/Inniskillin Ice Bar, which was the first-ever true ice bar at sea. When it comes to accommodation, Norwegian Epic offers a range of innovative accommodation options to suit every taste and budget. For guests looking for the ultimate in luxury, the ship features The Haven by Norwegian®, Norwegian’s exclusive ship-within-a-ship suite complex comprised of 60 suites and villas on two private decks located on top of the ship. Norwegian Epic was the first ship to offer the award-winning Studio staterooms designed and priced exclusively for solo travellers, giving guests the opportunity to cruise solo throughout Europe. Plus, Norwegian Epic also offers a wide variety of comfortable balcony and inside stateroom options and family-friendly accommodations including multi-room Suites, interconnecting staterooms and two-bedroom Family Suites. Norwegian Cruise Line’s largest Freestyle Cruising ship to date, Norwegian Epic, debuted in June 2010 and, in the United States, has been named “Best Overall Cruise Ship” by the readers of Travel Weekly two years in a row and “Best Ship for Sea Days” by Cruise Critic. The Company recently took delivery of its most innovative ship to date, the 4.000-passenger Norwegian Getaway in the first quarter of 2014. The largest ship to homeport year-round in Miami, Norwegian Getaway boasts 28 dining venues, including seafood restaurant Ocean Blue and a branch of Carlo’s Bake Shop by Buddy Valastro, star of the TLC series “Cake Boss”. The entertainment line-up includes Broadway shows Legally Blonde and Burn the Floor and the unique dining and magic venue, the Illusionarium. Known as New York’s ship, sister ship Norwegian Breakaway is the largest vessel to homeport year-round in the city. The Company has four 4.200-passenger vessels on order at Meyer Werft: Norwegian Escape with delivery scheduled in the autumn of 2015, Norwegian Bliss with delivery in the spring of 2017 and two further ships with delivery in the spring of 2018 and autumn of 2019. This entry was posted in Cruises, Transportation, Travel, Travel Services, Travelers and tagged Andy Stuart, Norwegian Cruise Line, Norwegian Epic, Western Mediterranean cruises. Bookmark the permalink.